This article will explain what a “Statement of LLC Organizer in Lieu of Organization Meeting” is and why you may need this document. We also provide a downloadable copy below. Note 1: If you’re forming your own LLC, you don’t necessarily need this Statement of Organizer, however, this article is a quick read and will give you a deeper understanding as to how LLCs are “organized”. Note 2: Understanding the difference between an LLC Organizer and an LLC Member is a strong foundation of knowledge which will help you understand the LLC’s Statement of Organizer. Before proceeding, we recommend reading this quick article first: LLC Organizer vs Member. What is a Statement of LLC Organizer? Note: If you are forming an anonymous LLC, don’t worry; this document is an “internal document”, and does not become a part of the public record. If you hired a company to form your LLC, such as Northwest Registered Agent ($39 + state fee), the Organizer they list (a representative at their company) has no ownership in your LLC. Therefore, they will provide a similar form to the Statement of Organizer which gives full authority to the LLC’s actual owners (Members) and they “step down”, relinquishing their duties as Organizer. Also, if the state where you formed your LLC does not have a place in the LLC Formation Documents to list the Member(s), this Statement of Organizer creates a better “paper trail”. While all 50 states don’t require you to submit a Statement of Organizer, this form will help you better document ownership of your LLC. Below, we explain why. Aside from listing the Members or Managers of your LLC, the Statement of Organizer will also contain a statement from the Organizer relinquishing all his/her rights and duties to the initial Member(s)/owner(s). Also, because most banks and organizations you might work with are not familiar with the “ins and outs” of LLCs; if your name is not on the LLC Formation Documents, they may get worried that you are not the real owner. To ease their uncertainty, they may need something a bit more “official” (even if you provided them with your Operating Agreement). In that case, giving them a signed (and notarized, if needed) Statement of Organizer as proof of ownership can really help. Remember: If you filed your LLC’s documents with yourself as the Organizer, you won’t need a Statement of Organizer. You can just present a copy of your approved Articles of Organization (or similar document, since not all states use the name “Articles of Organization”) to the bank or organization instead, and that will suffice. Having a Statement of Organizer is also important for the Organizer as it frees him/her from any liability. Since a Statement of Organizer relinquishes your rights and duties in favor of the member(s) and owner(s), you will not be involved in a lawsuit in case the LLC gets sued. A good example of this would be if you formed an LLC for a friend or family member (using our free 50-state LLC guides). In that case, having this document helps “remove you” from the LLC after your role as the Organizer has been fulfilled (aka, the state has approved the LLC). Again, even though the Statement of Organizer does not need to be notarized, sometimes banks (whose reps are rarely educated on the intricacies of LLCs), need more “certainty” that you are the actual owner of the LLC (even though you may have given them a non-notarized Statement of Organizer and a copy of your LLC’s Operating Agreement). Many times the bank is just looking to “connect the dots” and have a more official paper trail (to reduce their liability). So to satisfy the bank’s concern, you can notarize your Statement of Organizer and that should rest the case. If you are doing international business and need to further authenticate your LLC’s Statement of Organizer (or any form for that matter), you can have it apostilled. If you need a “Statement of LLC Organizer in Lieu of Organization Meeting”, you can use the free forms below. Do you have to file this statement of lieu with the state along with your statement of information? Hey Eric, nope, the Statement of Organizer is an internal document, meaning, it doesn’t need to be sent to the state or any government agency. Hope that helps! You’re welcome Eric! Do you means “lots of information” in a good way, or lots of information in bad way, as in that it’s hard to find? Let us know if you have any suggestions for making certain pieces of content easier to find :) Thanks! Lots of information in a good way, just when I think I’m done learning I find more to read. That’s awesome to hear! Just wanted to make sure… we’re always looking for ways to get better! I’m organizer for an LLC which I formed for my mother and now I’m working on opening a bank account. My question is which document operating agreement would be selected for my mom to be the owner and operator. Also do you have to fill out both agreements manager and member managed? Hi Freddy, your mother would just sign one Operating Agreement, not both. Which one she signs depends on how the LLC will be managed. More info on that here: Member-managed LLC or Manager-Managed LLC. Also keep in mind, that when opening an LLC bank account, your mother will need to be present. Hope that helps. Thank you! I appreciate the response. My mom wants to go with member managed and she would like to elect me as an external manager that way she is the member and owner of the business and I have the articles of organization so from previous posts you said that this document somewhat absolves you (me) of any liabilities after the oragnizer duties have been completed. What document would state that im a external manager so my mom can be binding contracts as a member while I manage the day to day business activities. My guess is member managed for my mom and she hire me externally to run day to day business activities. But which documents do I need? thanks again! As an LLC Organizer, you don’t really need to be absolved, since an LLC Organizer has no liability or responsibility to the LLC after the Articles of Organization are filed. Just because you “have” the Articles of Organization, doesn’t really mean anything. It gives you no control. The LLC is controlled via the Operating Agreement. You’ll want to chew on things a bit longer, but what this sounds like is a Manager-Managed LLC with one LLC Member. Your Mom is the only Member (owning 100%), but both she and you are Managers. You are technically a Manager and she is a Managing Member. You would use a Manager-Managed Operating Agreement and spell out the details within the agreement regarding duties, obligations, and control. I just emailed you a Manager-Managed Operating Agreement. Thank you so much Matt! You’ve made this process far less complicated than the documents seem. If I have any more questions I will post them and thank you for this website. Good Stuff! Matt, thank you for simplifying these complicated issues. I am a single person and I am forming an LLC to own a warehouse. I want the LLC (that is, the warehouse that it will own) to pass immediately to my living trust upon my death. Do I name the trust as the member in the Statement of Organizer, or what is the best way to make sure the LLC (and the warehouse) do not have to go through probate? Hi Jeff, thanks for the kind words! We don’t work with trusts a ton, so we don’t know. This question would need to be addressed with an attorney. Thanks for understanding. Hi Matt. 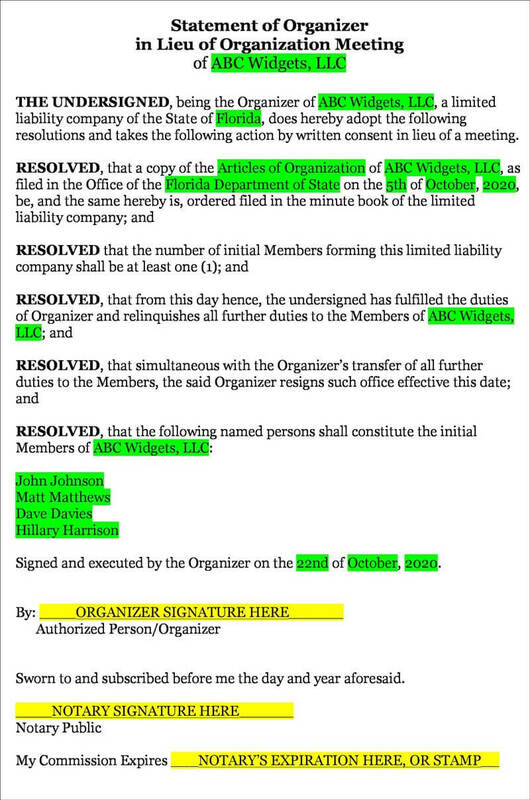 My Organizer (and my Registered Agent) issued “Initial Resolution” instead of “Statement of Organizer” is it ok? Hi Gene, yes, that’s okay. Usually it’s either a Statement of Organizer or Initial Resolution that is used. They have the same effect. Hope that helps. Matt. It’s still not clear for me – how to identify the owner of an entity. Owners are not indicated in Certificate of Formation, in Operational agreement only. But Operational Agreement is not filing to the Secritary of State and is an internal document of the entity. What if somebody (my registered agent team member) who knows the name of my LLC write the Operational Agreement and indicate himself as an owner and will try to operate the LLC or get the access to my busines bank account? Hi Gene, that is how LLCs are setup. The affairs of the LLC are internal. In the majority of states, LLC Members are not publicly listed. It’s all done via the Operating Agreement. If someone did what you’re mentioning, they would be breaking a number of laws.